The 2013 British Carriagedriving National Championships take place from Friday 13th to Sunday 15th September at Ashfields Carriage Driving Centre. Competitors will enjoy an extended marathon course of approximately 15k and eight international standard obstacles, one of which will be a water obstacle. As well as rosettes and plaques to sixth place in each Championship class, the first three will also receive commemorative medals. Can You Offer a Rescued Horse a Home? Despite the hard work and effort of World Horse Welfare, its supporters and the media to rehome as many horses as possible during April rehoming figures for 2013 are down 32% compared to the same time in 2012. Three family members have been banned from keeping equines for life after their pony was found collapsed in a field in Essex. Spirit, since renamed Frugal, was originally reported to the RSPCA by a member of the public in December 2012. RSPCA Inspector Matt Gough immediately attended the site, in Tilbury, Essex, and found a 2-year-old piebald cob in a state of collapse. He was unable to stand by himself, so the local fire service had to attend to help lift him from the muddy field. The pony was taken to nearby vets House & Jackson who confirmed he was suffering from starvation. After a few days he was transferred to Redwings Horse Sanctuary, where he has now made a full recovery. Staff at the Sanctuary named the pony Frugal as he arrived just before Christmas. The RSPCA have now brought a prosecution against three people who were supposed to be responsible for his care and all three were banned for life from keeping horses when sentencing took place at Basildon Magistrates Court. Victoria Jaggers of Wellington Road, Tilbury, her husband Kelly Trundle and her daughter Alicia Jaggers were all found guilty of causing unnecessary suffering to the horse and given a lifetime ban on keeping equines. Frugal has now been signed over into the permanent care of Redwings. The NAF Shining Star Award for June 2013 has been given to 12 year-old Wish Dior Cuddy-Thomas from Bedfordshire, a determined and talented member of the British Showjumping Northamptonshire and Cambridgeshire Junior Academy. Wish Dior has been awarded the NAF Shining Star because of the enthusiasm and improvement that she has shown during her time as a member of her local Junior Academy. The Essex and Suffolk Team were champions of this year’s Inter-hunt relay at this year’s Suffolk Show, watched by a large crowd in perfect conditions and held at Trinity Park, Ipswich. Caroline March, Lizzie Brown, Dan Spencer and Tiffany Morgan-Evans beat seven other teams to take this year’s title. It was a double celebration for team leader Liz Reid MFH, as her horse Marmaduke had won the veteran class the previous day. The Easton Harriers narrowly missed out to the Fitzwilliam by one second in the semi-finals putting the team, comprising Isabella Castle, Sarah Fortescue, Michel Grange and Lizzie Thomas MFH, with team leader Andrew Simpson, through to the finals. The course comprised six fences including the new painted footbridge and a bullfinch. The Suffolk had acquired the obstacles from the Royal Show. “They are just a taste of some of the ‘meatier’ courses to come in future years,“ said steward Lisa Kerr. The best turned out prize was won by the Essex Hunt, judged by Mrs Jenny Loriston-Clark and Mrs Pippa Martin. The Inter-Hunt team continued their success at The Peterborough Show on Wednesday 17th July, taking a credible second place out of 32 teams. The team from British Riding Clubs taking part in the CIC** European Championship at Laintal in Austria have returned home with a Team Silver medal and Individual Bronze. The competition began with a group dressage test where all six team members performed together. The result in this phase of the competition was considered to be the best that a British CIC** team had ever achieved, scoring an amazing 80 percent. The Team test was followed by individual tests and by the time the dressage element was completed, Team GBR was in second place. The riders put in excellent cross-country rounds and a good performance in the final showjumping test to ensure that they remained in second position to secure the Team Silver Medal. Earlier this month Shaun Copeman raised £443 for Redwings Horse Sanctuary when he completed the Norwich Cycle Ride… all in in memory of a very special equine. Shaun and his partner Toni Smith sadly lost their beloved 20-year-old Irish Draught, Bailey, in March of this year. He was a much-loved part of their family for nine years. Inspired by the amazing help they had received, Shaun resolved to give something back, and on the 1st of June he joined nearly 4000 other cyclists as part of the Norwich 100 mile bike ride to raise money for Redwings. Shaun completd the distance in 6 hours and 19 minutes, and raised just close to £450 for the charity. ‘I believe in Horses, I believe in Hope, I believe in Research’ is the message that Spinal Research is launching this month as part of their ongoing campaign to fight paralysis. The charity funds groundbreaking research to find an effective treatment for paralysis caused by a broken back or neck. Too many riders, both amateur and professional, are paralysed each year as a result of a riding accident. 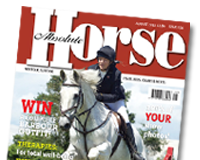 The charity is therefore appealing to equestrian enthusiasts, riding clubs, Pony Clubs, riding schools, equestrian centres and livery yards to support this campaign by organising an event such as a coffee morning or quiz night, or by adding a charitable donation to an entry form for a show that they are running. Many top riders from the equestrian world have pledged their support, including Nick Skelton, Mary King, Billy Twomey, Francis Whittington and Andrew Gould. To register your event at www.spinal-research.org or telephone 01483 898786 and a fundraising pack will be sent out to you. Equine insurer Petplan Equine is celebrating its 25th anniversary this year and to mark the occasion it is asking members of the public to choose their most memorable moments in British equestrian sport over the past 25 years. The public votes will be combined to produce a definitive top 10 favourite equestrian sporting moments from the past 25 years. Anyone wanting to register a vote can do so by visiting www.petplanequine.co.uk/top25 by the 16th August.